Before using the men's version of this hair, be sure your game is patched up to date, as EA fixed the hair-crashing bug in a recent update and if you're not patched up to date you may have problems. Following an inspiring discussion of colourful braid and/or ombre extensions in the comments on my last hair upload (thanks to Nouk and afgw for interesting info about them), I made some multi-coloured 'extensions' for the women's Long Braided Pulled-Back Hair. I was not able to make these 100% realistic (but then, I don't really 'do' realism anyway!) or get the halfway-up ombre effect, because the way Eaxis mapped these braids was really peculiar, with random parts of braids mapped on different parts of the texture. I had to join the pieces by trial and error, then compromise by hanging the 'extensions' at scalp level while leaving the top a solid colour. They're for men as well as women. I made a new modified mesh for men so that the hair fits their chests and backs better. (Using just a CAS gender override gives too much clipping into the male sims' bodies.) There will still be minor clipping in the modified mesh because I didn't want to stretch it too much to where there would be distortion, but it will go okay with most tops. The women's version contains 10 custom recolours plus a 'pure white' as an added extra, because Maxis's default white colour is more like grey and thought players might find a real white useful. The men's version contains the 9 most natural-looking default Maxis colours plus 7 of my 10 custom recolours (I excluded 3 pastel recolours, which I didn't think suited men), and the pure white. I didn't want to put all 18 Maxis colours in the men's package, wanting to keep the package size down. Below, we have: 1) Black with red and gold, 2) Dull dark brown with copper and brown for a Steampunk-y look, 3) Dark green with purple and bronze, 4) Black with green and purple, 5) Black with turquoise and blue, 6) Black with green and gold, 7) Black with magenta and blue, 8) White with platinum and lilac. 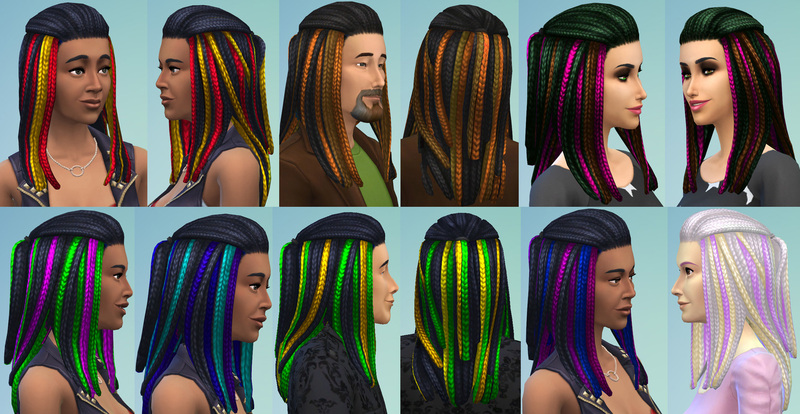 In addition, I made a men's modified-mesh package containing only the 18 default Maxis colours, as seen on the black-haired sim in the below pic, in case you'd like the men's hair mesh but don't want crazy custom extensions for your guys. You can have both men's versions in your game, as they don't conflict with each other, so you can have 18 Maxis colours plus also pick and choose from the custom ones. To continue: 9) White with pale pink and pale turquoise, and 10) White with pale hot pink and pale lime green. The next 4 pics are of how the new modified mesh fits the male body. One thing I did note was that if a male sim has a thick rounded back, there will be more clipping - I found that if I turned the sim sideways in CAS and dragged his shoulderblades forward to make his back less rounded, that would cure the excess clippage. Finally, the men's hair is hat compatible, as shown. 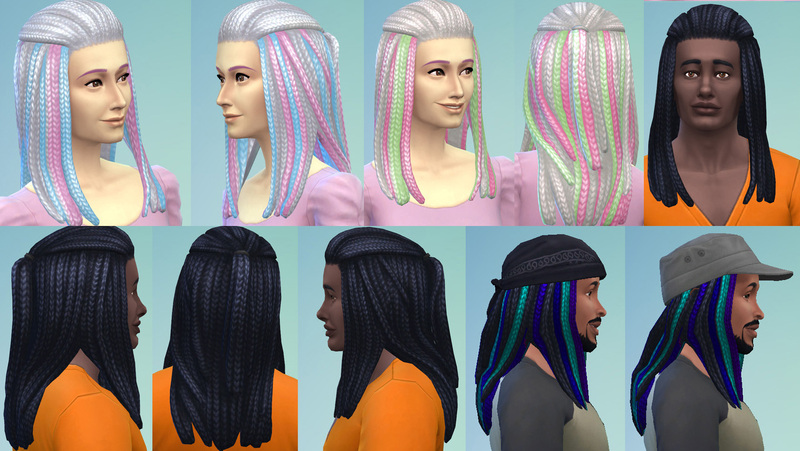 All packages are disabled for Random, so you shouldn't get townies appearing all over the place with crazy braids. They are all for Teen to Elder. Or, going down to the Blue Velvet to do some raving. Recolouring: This was a very frustrating texture to work with because of how it was mapped, but, if you're feeling brave, I've uploaded a separate zip file with the texture from the White with Pink and Lilac recolour in .bmp format, for you to use as a reference guide to see how to lay out the two different colours of extensions so that you don't get two of the same next to each other. Thanks for looking, hope you'll find this useful for brightening up your neighborhood. Download whichever zip files you want to use for your game. Unzip the zip file(s) and move the .package file(s) to your Documents\Electronic Arts\The Sims 4\Mods folder. Don't move the .bmp file to your Mods folder. 2790 polys for the men's mesh. 0 polys for the women's version. Men's mesh made with CMar's S4 CASTools and Milkshape. 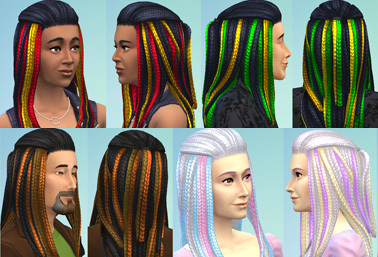 All recolours made with Sims 4 Studio. 483 people have said thanks to Esmeralda for this download.